To see how POD and POP work in real life, let’s look at two examples. The first example looks at a possible way that a chain of fast food outlets could challenge the market leader (in this case let’s assume that the market leader is McDonald’s). 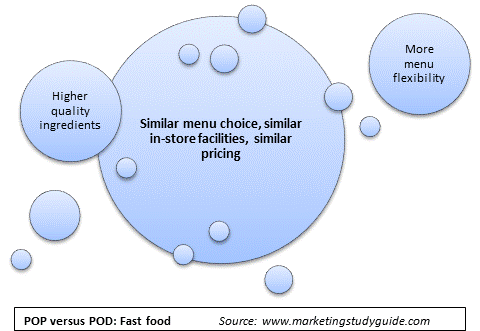 The center circle in the diagram below highlights the points-of-parity that the rival chain wants to duplicate (which includes a similar menu choice, similar in-store dining facilities, and pricing around the same level). However, the rival firm chain still needs to give consumers a reason to switch, so they have identified two points-of-difference to highlight as part of their overall positioning (which are built around high-quality ingredients and having more flexibility in the menu for the individual). The overall combination of POP and POD creates their overall positioning. The second example in the next diagram focuses upon a small education provider, who offers an alternative to a large university program. Again the large central circle highlights the points-of-parity (by highlighting that the qualifications and courses are similar). The points-of-difference (as highlighted in the outside circles) indicate that this particular college/school has decided to emphasize three major differentiating benefits. With these examples, you can see how the overall positioning is created using a balanced mix of points-of-parity (to piggyback on a market leader) and points-of-difference (to give consumers a clear reason to use their product/service).